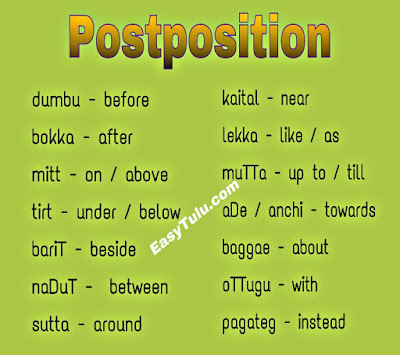 In Tulu, we do not use prepositions, rather we use postpositions. 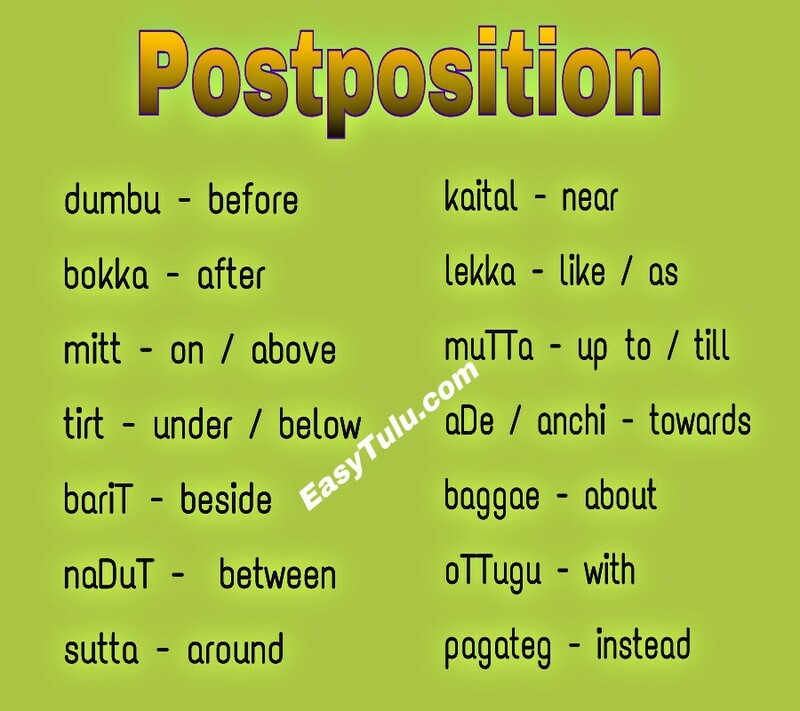 Postpositions are used the same way as prepositions in English (Examples: for you, in front of the house, between us, according to me, before dinner, after death etc. ), but they sit after the word that they modify. Generally postpositions are used to express relationship between a noun or pronoun and other parts of the sentence. English: It is raining from yesterday onwards. These postpositions can also be used with verbals. Following postpositions can also be used with verbals. English: Through TV and Radio people will get news. English: There is a fence around the field. English: Suresh has sat between Ramesh and Jayanth. 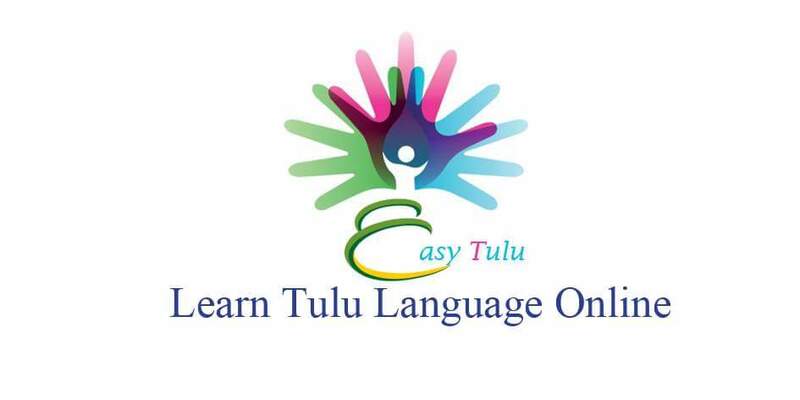 In Tulu we have another form to express the point of time at which the action terminates. The suffix ‘enge’ is added to participles. English: Wait until I make this. Tulu: ninan attandae bEtae Eren leppoDu? Englsh: Whom else should I call apart from you? Kannada: ninnannu allade bEre yArannu kareyali? Tulu: I attandae bEtae Er uller enk? English: Apart from you who else is there for me? Kannada: nInu allade bEre yAriddAre nanage? 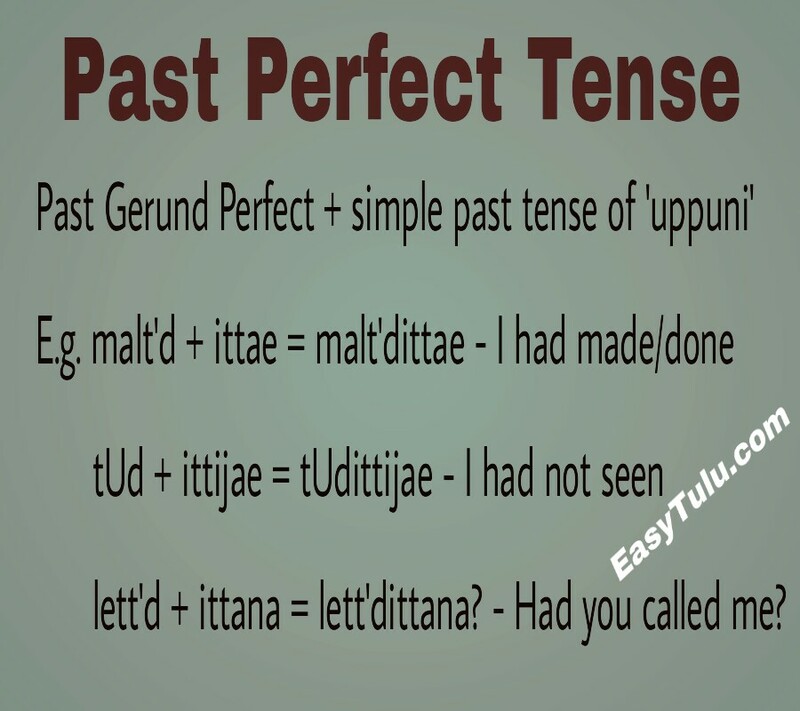 Today we are going to learn another tense, i.e. 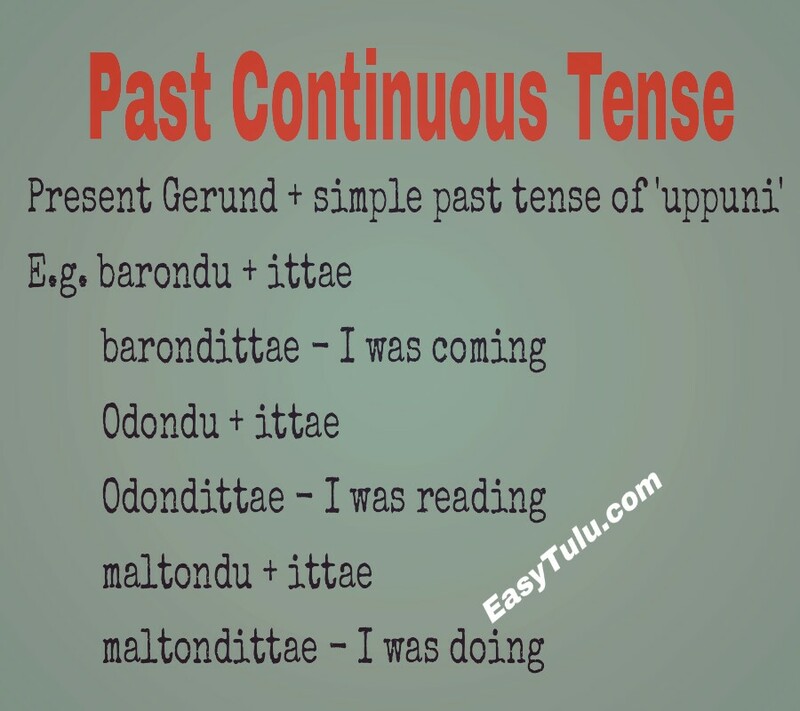 Past Continuous tense. Please review Present Continuous tense before we proceed. 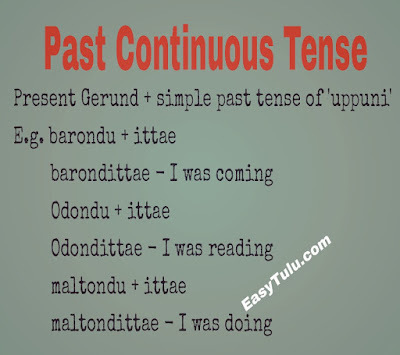 So, let’s take a very quick review of present continuous tense in Tulu first. Now, delete the ‘ullae’ and add simple past tense of ‘uppuni/ippuni’ (To be) instead. Here are the verb conjugations of the verb ‘uppuni/ippuni’ in simple past tense. English: What were you doing? Kannada: nIvu Enu mADtA iddiri? English: Where he was going to? Kannada: avanu ellige hOgtA idda? Negative forms in past continuous tense can be formed by using the negative form of the auxiliary verb ‘uppuni/ippuni’ in simple past tense. English: Were you waiting for me? Kannada: nInu nanage kAytA iddeya? 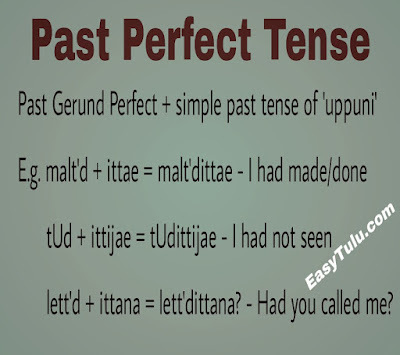 So, let’s take a very quick review of present perfect tense in Tulu first. Now, delete the suffix ‘ae’ and add simple past tense of ‘uppuni/ippuni’ (To be) instead. Negative forms in past perfect tense can be formed by using the negative form of the auxiliary verb ‘uppuni/ippuni’ in simple past tense. 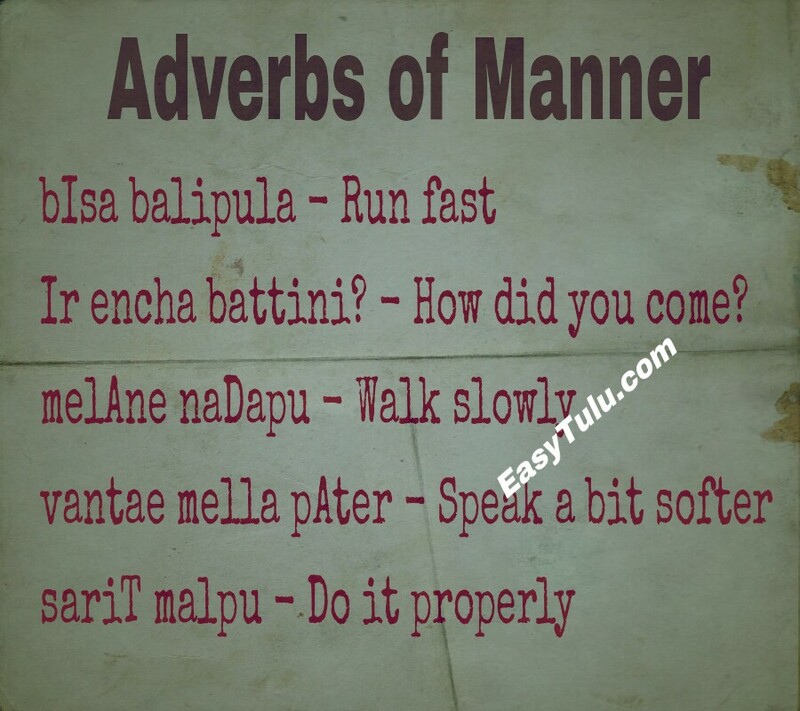 As you know, we have to add ‘a’ or ‘na’ at the end to make interrogative form of sentences in Tulu. When speaking with elders/strangers with respect, you can add ‘e’ or ‘ne’ instead of ‘a’ or ‘na’ at the end. Tulu: yAn niNDa suruve pandittijena? English: Hadn’t I told you before? English: Had he met you? English: Hadn’t you come last year? English: Had it rained day before yesterday? Today, we are going to learn adverbs of manner and purpose. An adverb of manner tells us how something is done or happens. Adverbs of purpose describe why something happens. 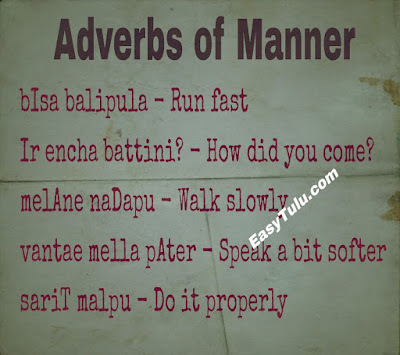 Most of the adverbs of manner are used in locative case or formed by affixing ‘Ad’ (Past gerund of ‘Apini’ – to become). Examples: sulabhaD, jAgrateD / jAgratae Ad, shOkuDu / porluDu, eDDeD, nijavAd etc. English: How did you come? English: He didn’t study for the exam, thus he failed. English: Why did he/she come? Tulu: Ir kODae gobberae dAyae battijar? English: Why didn’t you come to play yesterday? Kannada: nIvu ninne ADlikke Eke baralilla?